Let us feature your own success story. Help us share the messages of THRIVE by sponsoring our efforts to exhibit the film as widely as possible. Click the "Donate" link below to make a sponsorship of any amount you would like. Genetically Modified Foods threaten our health, the environment, and our ability to grow our own food. You can challenge GMO farming practices by joining Non-GMO movements and supporting organic, local farmers. Sign Up for Critical Mass Actions to create a GMO Free Zone with a critical mass of others; protest at the USDA and FDA offices to label and ultimately ban GMO products; and/or protest at Monsanto headquarters. You can tell us what actions interest you most by filling out the Critical Mass survey here. Greenpeace has been campaigning against GMOs since 1995. They got the Biosafety Protocol adopted in Montreal, Canada and are working to get countries to ban GMOs altogether. Natural Solutions Foundation is raising awareness to ban all GMOs. Organic Consumers Association is leading a movement against Monsanto, the largest biotech company in the world. It also educates about the benefits of organic farming and food. Shop at Your Local Farmers Market - Farmers markets often sell food from small, local, organic farms and are fun, lively events. 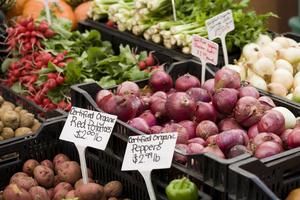 Find a farmers market near you. Join a CSA - Get your food in a box on a weekly basis from local farmers and consider sponsoring someone who can’t afford it to receive CSA harvests. Find a CSA near you. Or View more listings of CSA’s throughout the U.S.
Use a Non-GMO Shopping Guide - You can download a hard-copy of a Non-GMO shopping guide on The Center for Food Safety's website, or get their Free Mobile App.